Your heartburn meds are killing you! Heartburn Meds: Do They Do More Harm Than Good? Could common heartburn drugs increase stroke risk? Should you be taking stomach-acid reducers? A new Paradigm in Acid Reflux. Many Americans who suffer from heartburn find relief from the discomfort by taking proton pump inhibitors - an over-the-counter medication. Although these drugs are widely used, concerns are mounting over their long-term effects on the body. Recent studies have demonstrated links between proton pump inhibitors and a range of health conditions. A new study, published in Circulation Research, finds a potential mechanism to explain these negative health implications. when acid from the stomach finds its way into the esophagus. 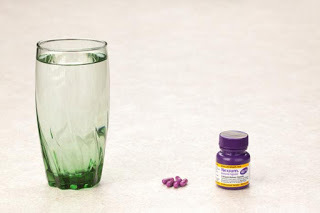 The condition can be very unpleasant and, because proton pump inhibitors (PPIs) are easily available and clear up symptoms quickly, they have proven very popular. According to the U.S. Food and Drug Administration (FDA), 1 in 14 Americans have used PPIs at least once. In 2006, an estimated $7 billion was spent on PPIs globally. Esomeprazole, brand name Nexium, is one of the most commonly purchased PPIs. In 2015, Nexium created almost $2.5 billion of revenue for drug manufacturer AstraZeneca. Because these drugs are so effective at relieving reflux, and because they do not require a prescription, they are used much more widely than initially predicted. PPIs were never approved for long-term use by regulatory authorities and recent studies have shown a number of worrying correlations. Health problems related to PPIsHeart disease, kidney disease, and dementia have all been linked to long-term PPI usage. However, studies to date have only been able to demonstrate correlation, rather than causation. Also, until now, no known mechanism has been uncovered that can explain the findings. Recent research, carried out by Dr. John P. Cooke at Houston Methodist Research Institute, TX, investigated a potential molecular mechanism by which PPIs might induce their negative health effects. Dr. Cooke believes that premature aging of the endothelial cells that line the interior of blood vessels might be part of the answer. The researchers investigated the role of two PPIs, one of which was Nexium. They found that prolonged exposure to the drugs led to premature biological aging of these vascular cells. "When healthy, human endothelial cells create a Teflon-like coating that prevents blood from sticking. When older and diseased, the endothelium becomes more like Velcro, with blood elements sticking to the vessel to form blockages." Lead author John P. Cooke, M.D., Ph.D. This change to blood vessel linings might help explain some of the negative health consequences of PPI. Interestingly, it was not the only cellular change that the researchers observed. PPIs and lysosomesPPIs are designed to prevent acid from being produced in the parietal cells of the stomach. They irreversibly bind to the gastric proton pump, stopping gastric acid production almost completely. However, these are not the only acid producing cells that appear to be altered by the drugs. Lysosomes are present in many cells of the body and are responsible for clearing up unwanted debris. They clear up cellular garbage and break it down using acids. If the metaphorical trash accumulates, cells age faster. Results from the study showed that PPIs prevented lysosomes from producing an adequate supply of acid. In other words, their ability to remove the rubbish was diminished, causing premature aging of the cells. Interestingly, other GERD medications that work by a different mechanism - H2 antagonists - do not exhibit this effect on lysosomes. Dr. Cooke hopes that these results will help convince official bodies to draw up stricter guidelines around the use of PPIs. "Unless otherwise indicated, physicians should consider PPIs only for short-term use for relief of symptoms of GERD, since we now have a 'smoking gun' that helps explain the consistent observational evidence of increased risk." John P. Cooke, M.D., Ph.D.
Other potential methods for controlling GERD include lifestyle modifications, H2 antagonists and, in some cases, surgery. The current research centered around in vitro (outside of the body) investigations, so further research in humans will be needed to firm up the findings. If the results are backed up by future studies, they might eventually lead to wide-ranging changes in the way PPIs are regulated. Chronic use of some drugs for heartburn and gastroesophageal reflux (GERD) speeds up the aging of blood vessels, according to a published paper in Circulation Research (early online), an American Heart Association journal. This accelerated aging in humans could lead to increased cardiovascular disease, vascular dementia and renal failure.These findings by a Houston Methodist Research Institute team are a progression of the work that John Cooke, M.D., Ph.D., began more than five years ago, and support recent epidemiological and retrospective studies that observed associations between the long-term use of proton pump inhibitors (PPIs) and an increased risk of heart attack, renal failure and dementia. PPIs like esomeprazole (Nexium) are widely used for the treatment of GERD. These medications are sold over-the-counter in the United States so medical supervision is not required. While these drugs are effective when taken as prescribed, they were not approved for long-term use and evidence suggests that up to 70 percent of PPI use may be inappropriate. Cooke, the paper's senior author, and team showed that chronic exposure to PPIs accelerated biological aging in human endothelial cells which line the inside of blood vessels. When healthy, human endothelial cells create a Teflon-like coating that prevents blood from sticking. When older and diseased, the endothelium becomes more like Velcro, with blood elements sticking to the vessel to form blockages. "When we exposed human endothelial cells over a period of time to these PPIs, we observed accelerated aging of the cells," Cooke said. "The PPIs also reduce acidity in lysosomes of the endothelial cell. The lysosomes are like cellular garbage disposals and need acid to work properly. We observed cellular garbage accumulating in the endothelial cells, which sped up the aging process." Cooke suspects that this may be the unifying mechanism that explains the increased risk of heart attack, renal failure and dementia observed in long-term PPI users. "These drugs do not seem to adversely affect the heart and blood vessels when taken for a few weeks. However, we urgently need studies to assess the impact of long-term use of these drugs on vascular health in a broad patient population. We also need to consider if these drugs should be so accessible without medical supervision." Cooke's earlier work identified at a molecular level that PPIs might cause long-term cardiovascular disease and increase a patient's heart attack risk. That work led to a collaborative study with Stanford University colleagues (PLOS ONE, June 2015) to show that in two large populations of patients, adults who used PPIs were between 16 to 21 percent more likely to experience a heart attack than people who didn't use the commonly prescribed antacid drugs. Cooke, who holds the Joseph C. "Rusty" Walter and Carole Walter Looke Presidential Distinguished Chair in Cardiovascular Disease Research, said while PPIs were shown to affect vascular aging, H2 blockers like ranitidine did not adversely affect the endothelium. Brand examples of H2 blockers are Zantac and Tagamet. The FDA estimates about 1 in 14 Americans have used a PPI. In 2009, PPIs were the third-most taken type of drug in the U.S., and are believed to account for $13 billion in annual global sales. In addition to GERD and heartburn, PPIs treat a wide range of disorders, including infection by the ulcer-causing bacterium Helicobacter pylori, Zollinger-Ellison syndrome, and Barrett's esophagus. PPIs come in a variety of forms, always ending with the suffix "-prazole," and other brand examples include Prilosec and PrevAcid. The above post is reprinted from materials provided by Houston Methodist.